We are manufacturer of Push to Talk baes Talk Back Papaging System or Pa-paging communication system for Industrial area. The system is battery operated for emergency communication when power will shunt down in any emergency . The system has been designed as par Fire Fighting Rules. This system will be use at steel plant, Power Plant or Safe Area . Noise Cancelling type( ABS type) hand set with push Button switch Available for Two Way communication . 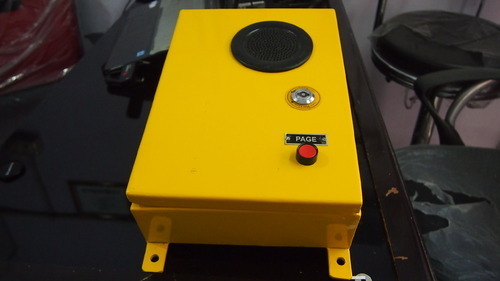 A central Paging Amplifier Control unit will be available for "All Call " Announcement from any Paging Station with individual Industrial Horn Speaker for Loud Voice / Imidance 15 WATT TO 60 WATT Maximum . A central Power Supply Unit required for battery charging / It will be One No.of 05 No's Paging Station . Established in the year 2013, at New Delhi (India), we, “AS Techno India,” are recognized as an eminent manufacturer, trader and supplier of a wide variety of Access Control System, Flameproof Hooter, FLP Product, Security System, Wire and Wireless Communication System, Fire Alarm System & Safety, Security, Controls and Explosion Proof / Flame Proof Equipments etc. These products are designed and assembled using the finest quality components and ultra-modern technology. Offered products are extensively appreciated by our esteemed clients for features like excellent performance, compact design, energy efficiency, easy installation, use-friendly operation, longer service life and durable finish standards. These products are offered in various technical specifications to meet specific requirements of clients. Further, these products are mainly used in industrial and commercial sectors all across the country.